So this year I am on a mission to try new activities. For me, with my teenagers, family time works best when we are all equal and no-one is the expert (especially not me). This is really important as it helps me to step back from the parent role and actually enjoy myself and it gives my youngest son a chance to be better than his older brother (or at least better than me) which is great for his self-esteem. Ideally, there is an instructor or another adult in charge showing us all what to do and laying down the rules (so I don’t have to). But most importantly, we have all got to want to be doing it (see planning successful family time with teenagers). So here’s my review of the fun family activities we have tried so far this winter – I hope you find it useful. We’ve done quite a few high ropes courses over the years. The first one (as part of a PGL Family Adventure Holiday when the children were much younger) scared me witless. The best course so far has definitely been Montcalm in the French Pyrenees. It being winter, this year we tried out an indoor high ropes course at the XC extreme sports centre in Hemel Hempstead. Having done lots of high ropes before, I was a bit worried that this course would be a disappointment – it’s not very long and not especially challenging. But it is high up and there is a great free fall jump at the end that the teens really loved. The teenage verdict? “A bit tame but fun.” My verdict? This particular course is probably better for tweens than teens – but a huge recommendation for high ropes as a great family day out! I had no idea what to expect when we signed up to indoor caving (again at XC). The photos on the website looked a bit dull but the experience was absolutely brilliant. As soon as we were in the caves the teens were squealing like toddlers at a soft play centre (there’s even a ball pit). They loved it! It was quite challenging – there are some very small spaces to wriggle through – and it is definitely not for the even mildly claustrophobic. I found it quite hard on my knees and didn’t last as long as the teens – who were in there for the best part of an hour and came out glowing and gabbling like five-year-olds after a bouncy castle party. Highly recommended! So, I have to admit, I opted out of this activity and let the teens get on with it (along with a couple of their friends). I intended to have a go but was not-so-politely informed that a) racing your mum is uncool b) I am a speed wimp so wouldn’t enjoy it. My Plan B was to sit and watch the boys enjoying themselves from a nice warm café with a good coffee. Alas, the absence of good coffee or anywhere warm left me wishing I’d just joined in instead. Oh well, lesson learned! 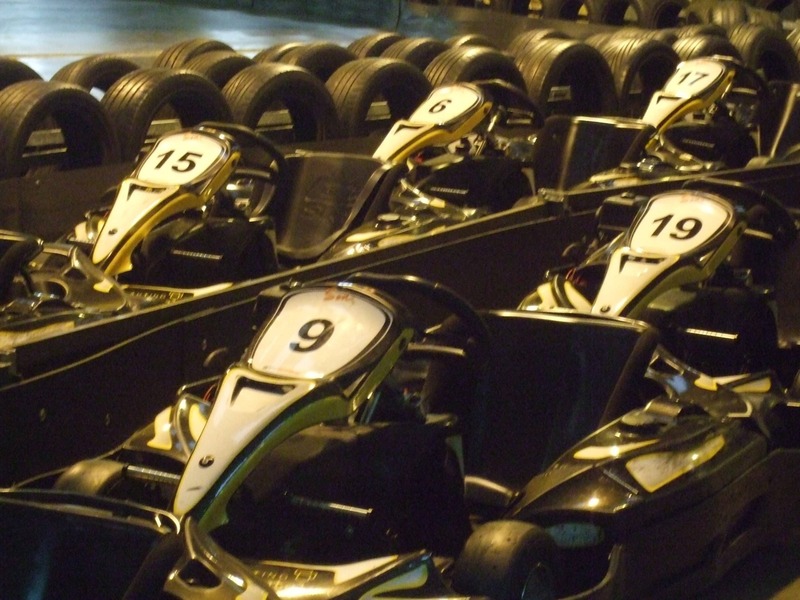 I was a little worried when the teens set off around the Absolutely Karting track and had crashed within the first lap… but they got the hang of it and, despite a few stop starts, had a great race. The track we did had two storeys, with ramps in between, which made it a bit more challenging than any other karting they had done. Karting is not great for talking to each other during the actual event but you know they’ve had a good time when they all talk at once all the way home! The post-race computer print outs of average speeds, best and worst laps, with coloured graphs and complicated statistics, even made me feel like they were doing a bit of maths….. Climbing is one of those sports that transfers indoors really well so it’s an ideal candidate for fun family activities in winter. We did our session at XC in Hemel Hempstead but there are loads of brilliant indoor climbing venues across the country. Ours was a mixed session of bouldering and climbing – bouldering is done without ropes on quite low walls on a soft floor (in case you fall off) whereas climbing walls are much higher (especially at the XC!) and involve safety harnesses. If you have a basic level of fitness and haven’t yet been climbing with your teenager then I’d really urge you to try it. Getting further up a climbing wall than they thought possible – through problem-solving, will power and effort – is a massive positive learning experience for teens. Not to mention the incredible buzz of adrenaline when you get back down – which is a real incentive for teenagers to step away from their screens again and get physical. If you have suggestions of fun family activities for teenagers, please do comment below or tweet me on @thinking_parent. Check out the spring edition for ideas for when the weather warms up (More fun family activities to tear teens away from tech) or if you have a whole weekend to spare, try these Fun family weekends to tear teens away from tech! And check out these ideas for keeping teens off tech in the long summer holidays. This is not a sponsored post but we were very grateful to receive free entry to XC and Absolutely Karting for review purposes. The opinions expressed are very much my own. See Disclosure Notice for more info. Enjoyed this review? Subscribe to monthly newsletters for lots more parenting tips. Will definitely add bowling to the next edition, great idea! There were some tiny little kids scampering up those climbing walls so it is never to young to start! Great list. We’re lucky enough to have a roller blade place near us and the Tubblet really loves going there, but it is a special treat as it’s quite pricy. Roller blading definitely going on my list for the next post, brilliant suggestion! Setting myself the goal of writing this post did help to galvanise me into action! Being able to do adventurous stuff together is one of the great things about having older children so I need to make the most of it before they’re all grown up and gone! There were some really little children on the climbing walls (I think they are more fearless!) so it won’t be long before you can do it together! Segway is definitely on my list for the Spring/Summer edition!! Good point. I think the best family time we have is when we feel like a good team! Great active things to get older kids outside and having some good clean fun. I will keep them in mind as for my young man. Things can be very expensive, that’s true. Trying to spread out the costly stuff and spacing it out with freebies such as walking is a really good idea….. I love the idea of fencing! Will be straight off to the internet to find out where we can try that out locally! I found the caving quite challenging but there are escape routes all the way round which was reassuring! Some great ideas here! Like most families with bigger kids, our time seems to be split between activities they do on their own (football, Scouting, dancing) and sitting around in front of various screens! Our kids do like a challenge though, they particularly like climbing Snowdon, for some reason! I did it a couple of years ago and never want to do it again! We also do Parkrun as a family most weekends, which gets some exercise in the bag before most teenagers are even out of bed! I am a huge fan of Parkruns and will be featuring those in the Spring edition of this post! Am worried about the start of the holidays with an 11yr old girl & a moody 13 yr old son – we have a very small budget (due to house renovations); daughter is sporty & fearless & son is not sporty & afraid of heights (as am I !). We have a small dog (no one wants to take out except me !) & husband & son are addicted to screens ! Great to have found this info – look forward to reading more ! SUP (stand up paddle boarding) is growing in popularity – it’s even available at our local outdoor centre along the local river. It’s an interesting one as a slightly more balance oldie (i.e. Mum) can be better than a bull in a china shop (i.e. teenager) – at least to start with! Great idea – I’ve not had a chance to try paddle boarding yet but it’s on my To Do list. I was absolutely rubbish at surfing but it was the getting up part that was so hard. So maybe if I’m already standing I might be a bit better!